Dalton Highway is far removed from civilization, and there were reports of frequent wolf attacks, including fatalities. I did not feel like risking it without some sort of a weapon, and started researching my very first gun purchase. I wanted something that would allow quick follow-up shots in case I miss the first time, and low recoil, as I was a complete newbie as far as firearms were concerned. After reading a bit, I realized that these two conditions mean a semi-automatic rifle. There were not many modern semi-auto rifles, with Browning BAR being almost the default option. However, right here I ran into the wall. I realized that the rifle is available in several "calibers", and I had no idea whatsoever what these were, and which one I needed to buy. So my wife and I went to a gun shop and they sold us a Mossberg 930. But that's another story! So... I am new to firearms, which caliber should I buy? Let's start with a bit of terminology. What you load in a rifle or a handgun is called a "cartridge". The shotgun equivalent is called a "shot shell". Many people confuse a cartridge with the bullet. A bullet is only a part of the cartridge - it's what flies towards the target when the rifle fires. I often hear people call cartridges "bullets" ("I need to buy more bullets"). This is incorrect. A cartridge generally consists of a bullet, a case, a powder charge, and a primer. A striker pin in a rifle or a handgun ignites the primer by, well, striking it. The primer in turn ignites the powder charge, which burns, produces a lot of hot gas at very high pressure, which forces the bullet out of the rifle bore and sends it flying towards the target. Fun fact: modern smokeless powder is not an explosive. It produces a lot of heat as it burns, but unless it burns in a confined place, it tends to burn rather slowly. And it is not that easy to ignite! If old ships were to use smokeless powder, it would incinerate the ship if the powder room were to be set on fire, but not blow it up. Huge explosions on the old ships were caused by black powder. Primer, on the other hand, is made of an explosive element. However, there is only a very tiny bit of it in a cartridge. Fun fact 2: First cartridges had priming compound smeared on the base of the bullet. The striker was a needle that pierced the cartridge and the powder charge to strike the bullet and produce ignition. The difference between the rimfire and centerfire cartridges is in where the primer is. In a centerfire rifle, the primer lives in a small metal cup at the base of the case. In a rimfire cartridge the case has a soft rim, and the primer compound is smeared on the inner surface of this rim. Shot shell is similar, except the bullet is replaced by tiny balls of lead (or steel) called "shot". To make sure hot gas propels the shot charge rather than escaping through the gaps between the shot particles, at the base of the shot charge there is a wad, which in modern shells is usually made of plastic. Over the long history of firearms, many different ammunition types were invented. A caliber is simply a name for the particular type of cartridge. The rifle and handgun calibers usually start with the diameter of the bore, for instance, the bore that shoots "223 Remington" has a diameter of 0.223". Fun fact 3: The bullet is usually slightly bigger than the bore. For instance, the bullet in 223 Remington actually has a diameter of .224". The unit of measurements are either inches or millimeters. Which one has to be guessed from context. For example, in 308 Winchester the bore diameter is 308 thousands of an inch (0.308"), in 30-06 the diameter is, actually, also 0.308". 40 S&W the bore diameter is .4", and in 45 ACP it is 0.45". Sometimes 40 S&W is written as .40 S&W, which makes the fractional nature of the first number explicit. Either way you know that these are fractions of an inch because 40mm would be way too big, and .40mm would be way too small. On the other hand, 5.56 in 5.56x45 is the diameter of the bore in millimeters. Similarly, 7.62x39 means that the diameter of the bore is 7.62mm. Sometimes the units are explicit, as in 7mm Mauser or 9mm Luger. Interestingly, 7.62x39 uses the bullet that has the diameter of 0.310", the bullet diameter in 7.62x54R is 0.311", and the bullet diameter in 7.62x51mm NATO is 0.308". Likewise, the bullets in 9mm Makarov and 9mm Luger are different diameters. The number gives an indication of the size of the bullet, but you have to consult the specification of the caliber to really know. Fun fact 4: The bullet for 38 Special has the diameter of .357" - it is the same as in .357 Magnum! While the first number indicates the diameter of the bullet (or bore), the rest of the caliber name can be anything - from the year the caliber was adopted for service (30-06 was adopted in 1906), to the size of the case (7.62x39 has the case that is 39mm long; 7.62x54R has the case that is 56mm long), to the name of the person who designed it, or a company who productized it (308 Winchester, 223 Remington). Or anything else - there really are no rules. 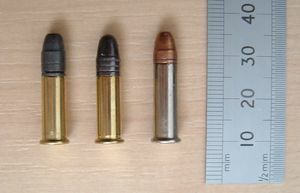 Unlike rifles, shot shells are in external dimensions, and a single shotgun bore can shoot loads with shot of different sizes, from a single slug that has the diameter of the bore, to a load of tiny little pellets. The designator for a shotgun caliber is the diameter of the bore (expressed in gauges) and the length of a chamber (expressed in inches). For instance, people would say '12GA 3" chamber'. Gauge is the measure of how many balls of lead of the diameter of the bore would weigh one pound. For instance, 12GA shotgun has a bore diameter of 0.729", and 12 lead 0.729" balls will weigh 1lb. Here the smaller the gauge means the bigger bore: 20GA bore is smaller than 16GA bore which is in turn smaller than 12GA, which is smaller than 10GA. There is the exception for the very smallest of the shotgun bores: 410 shotshell is measured in fractions of an inch, so the bore diameter is 0.410". Let's get the simplest one out of the way. Modern shotguns are available in 3 calibers - 12GA (which is what most shooters will need), 20GA (if recoil is a very important issue), or 410 (for the very youngest of the shooters). So there we go - buy 12GA by default, 20GA if you are buying for a small female or a young shooter, or 410 if the shooter is very, very young. Note that both 12 and 20GA shotguns are legal for deer hunting in Washington State. If you goal is to learn how to shoot well, you should first buy a 22LR gun. Practice makes perfect, and you will need a lot of it. 22LR is very cheap to shoot (cheapest ammunition costs as little as $2 per box of 50 rounds, compared to $10+ for the cheapest centerfire pistol rounds). Not only the ammunition is inexpensive, it also is very easy on the gun. A typical resource of a centerfire rifle's barrel is 2000-5000 rounds. A typical resource of a rimfire rifle's barrel is 50000-150000 rounds. As an added benefit, a rimfire barrel is almost never requires cleaning - some people clean it once every 500 rounds, some people never clean it. Because the round is low pressure, there almost never is any metal fouling in the barrel, and carbon fouling is wiped off by the next shot. So you can spend more of your time shooting! Note: while cleaning is optional, you should still oil it after the shooting session! Rimfire pistols such as Browning Buck Mark or Ruger MKIII Target (the ones you should buy) are extremely accurate, easily capable of shooting 1" 5-shot groups at 25 yards, the accuracy that can only be duplicated by the most expensive centerfire pistols (Les Baer gives similar accuracy guarantee for the pistols that cost over $2000). In both pistols and rifles 22LR produces very little recoil, and is a pleasure to shoot. This rounds also allows you learn essentials of shooting - reading the wind, estimating the bullet drop, etc - at a shorter range. There are no ranges in Seattle areas that are over 300 yards, for instance, whereas 100 yard ranges are ubiquitous. The ballistics of a rimfire round at 100 yards is very similar to that of a centerfire round at 500. Fun fact 6: While 22LR is small, it is still very lethal. It is considered dangerous at the distances of up to 2.5 miles. According to this study, a 22 caused higher percentage of fatalities in people shot by it than almost all other calibers, except 357Mag. Yes, including the 45! There are very many calibers that are designed for hunting. When selecting yours, it is important to remember that the minimum legal caliber for deer in State of Washington is 243. Speaking of guns... Check these out! I recommend 308 Winchester, because of several factors. First, it is sufficient for any game that can be encountered in North America. Second, a wide variety of ammunition is available in every price range. Finally, with the right rifle it can double for target shooting (see below). The only reason to not choose 308 Winchester is the recoil. It is stout. If the shooter is young or frail, I would consider 7mm-08 Remington instead. Please see this Wikipedia article for details. If you are a farmer and need to protect your fields from pests such as prairie dogs, I would recommend 223 Remington. Varmint hunting is very similar to target shooting, and the reasons for the caliber recommendation are the same, so please see below. For a beginner shooter choose a bolt gun in .223 Remington, such as Savage 10fp or 10fcpk. This round has a very low recoil so if allows focusing on one thing at a time - aiming, trigger discipline, reading wind - without having to hold on to the gun for dear life. 223 is extremely accurate. It is a relatively low pressure round, which means that the barrel will last longer. Wide variety of ammunition is available, from plinking to match. Because of the popularity and high production volumes, the ammunition is cheaper than comparable quality rounds in other calibers. This round is easy and cost-effective to reload, and wide variety of components are available relatively inexpensively. However, note that you will not be able to use this round for deer hunting - the minimum legal caliber for medium to large game is .243. If you want to shoot long distance, choose a bolt gun in .308 Winchester. You can go with a proper competition gun from Savage 12 series, or if you want the rifle to double as a hunting rifle, a Savage 10fp or 10fcpk will work great. .308 is the bigger brother to .223. All the logic above applies - the accuracy, the low pressure, and the availability of the ammunition and components. 22LR competition pistols deliver the most accuracy for the money. My Ruger MKIII Target and Browning Buck Mark Camper both easily deliver 1-1.5" 10-shot groups at 25 yards. They are also cheap and pleasant to shoot, are acceptable at many club-level competitions, and are great for teaching new shooters. I think everyone's first pistol should be one of these two, and everyone's first pistol caliber should be a 22. Traditionally the world's most accurate large caliber pistol platform is 1911. It's not that it is inherently more accurate it is that - being a standard military sidearm for many years - enough resources were invested into it as a competition platform, and so both manufacturing companies as well as gunsmiths know how to squeeze every last bit of accuracy out of it. Les Baer for instance provides an accuracy guarantee of 1.5" at 50 yards on some of its pistols. A 1911 has a surprisingly low recoil for the caliber size, and is quite pleasant to shoot. I would recommend a 45 as a SECOND pistol caliber for target shooting after 22LR. 9mm and .40S&W are gaining ground as competition caliber because of "practical pistol" shooting discipline championed by organization such as IDPA. CZ makes extremely accurate guns in both calibers. If you plan to compete, a .40 pistol has an advantage in scoring, and if you learn to shoot it accurately, shooting a 9mm would be a breeze. Sometimes an availability of a gun is a deciding factor in the choice of a caliber. CZ 75 Tactical Sport is available in both, and both sometimes pop up on the market. However, Shadow Target is not made in .40 - and it did force me into buying a 9mm gun for shooting (as opposed to collecting) for the first time. However, because of surplus market is reach with all the recycled police guns, great deals are available in .40S&W, this being a standard police caliber. These are usually not proper match pistols, but they are cheap - occasionally a surplus Gen 2 Glock 20 can be had for as low as $350. Anything that lives in North America - except for a grizzly bear - can be handled with a .40S&W or a .45ACP. Many people prefer revolvers as trail gun, and a few great deals can be had in police surplus market in 38 Special. Absent a particularly good deal though I would recommend a .40. Autoloaders are easier to shoot several times accurately (double action usually comes with a very stiff trigger in revolver, and stiff trigger means less accuracy). A fairly decent Hi-Point JCP can be had for a pittance and provide plenty of inexpensive protection in the forest. And, of course, tons of surplus police Glocks and Berettas are available in secondary market very cheaply. Before buying a firearm for self-defense, we recommend that you read this. If, after reading it, you are still not dissuaded, there is a raging debate as to whether 9mm Luger is better than .40S&W because of its lighter recoil, or .40S&W is better because it is more powerful. Truth be told, recoil depends as much on the design of the gun as it does on the caliber. For instance, my P64 in 9mm Makarov has a bigger felt recoil than my RIA 1911 Match. I like 40 caliber. Not because it can kill more effectively. No, the probability that I will actually have to use the gun on a human target is practically zero. And, of course, the probability that the target would not have been incapacitated by a 9mm round is even smaller. Together these make for a probability so small it does not merit a consideration. The fact is, .40S&W is a standard law enforcement caliber. Police departments rotate their weapons frequently, and as a result there is a steady supply of severely discounted firearms chambered in it. For instance, a used 9mm Glock will set you off at least $450, and new are supposed to retail for over $500, but Gen 2 and Gen 3 Glocks in .40S&W are broadly available for less - and sometimes significantly less - than $400. So I ended up with a bunch of .40 guns organically - because I got a few deals that were just too good to refuse. In addition to availability and price, a .40 gun can double as a trail gun sufficient for protection against almost any animal except perhaps a few species of bears. If you are looking for a concealed carry pistol, an eastern block police/military sidearm such as Makarov or CZ82 or P64 can be had very inexpensively on the surplus market - at roughly half to a third of the price for comparable in quality modern handgun. The accuracy is very acceptable, the pistols are very small and naturally good for concealment, and the caliber is more powerful than .380ACP which is the popular western caliber in similar form factor. Ammunition is priced similarly to 9mm Luger and is broadly available. 9mm Makarov is definitely worth looking into!